CCBoot has introduced the "Admin password" for quite some time now. And its used for many functions to work like lock/unlock CCBoot UI, image upload, enable/disable superclient from client, etc. So, let's see how we can set "Admin Password" for CCBoot. 1. Click "Option" on the CCBoot toolbar. 2. It will open "CCBoot Options" dialog box. 3. In "General" tab, beside the "Admin Password" text, enter your desired password (Figure 1). 4. Click "OK" button the save the password for CCBoot. 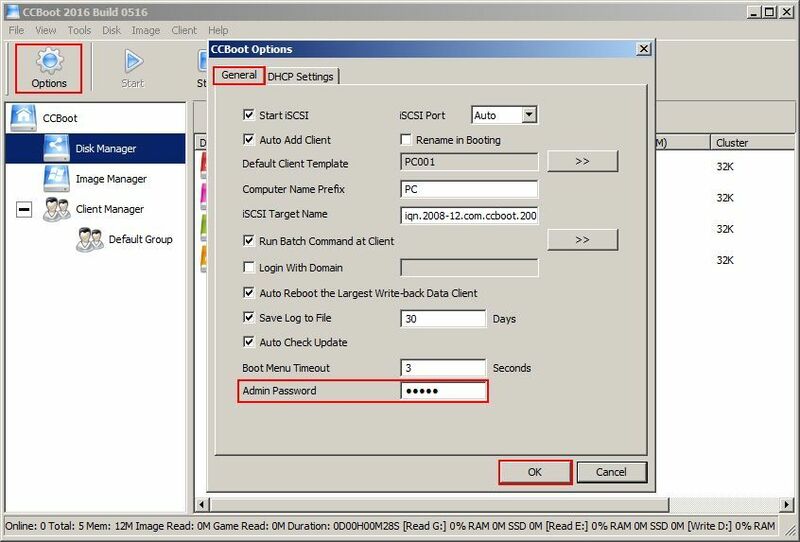 You can lock CCBoot UI to prevent unauthorized personnel for making any changes to the settings and configuration of the server and clients. And the admin password is used to unlock it, to make changes by authorized personnel. In recent version, we have made it so that you can enable or disable superclient right from the client pc so you don't need to come back to server to save the changes. The admin password is needed to be entered when you click either of the buttons to use the corresponding function, failure to enter correct password will prevent it. 3. Upload image to server. But to prevent unauthorized user/personnel from uploading images randomly and filling up the image disk, the admin password prevent the action as the function will not execute without entering the correct password. If you have forgotten your password, you can open the ccboot.ini (you can find it it installation folder) and find the string Password=(here must be encrypted password ), then delete everything after the " = " in this string, save changes in this file and then restart ccboot.